After that Allah proclaimed for him the spiritual opening and united him (Ash-Sha’rani) with al-Khawwas. Al-Khawwas was his mi’raj and his ladder by which he ascend to the doors of spiritual openings and heavens of bestowals and realms of light and inspirations. 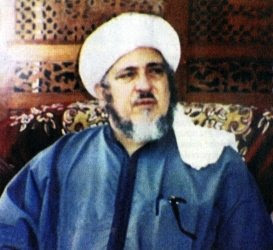 Their relationship is the manifest sign of the status of the Shaykh in the Path. It is the greatest sign of the status of divinely bestowed knowledge (العِلْم اللَّدنِّي) for al-Khawwas was unlettered while ash-Sha’rani was a scholar. But that was the external judgement, while the internal judgment says that al-Khawwas was the scholar while ash-Sha’rani was the unlettered one. My spiritual struggles at the hands of my master ‘Ali al-Khawwas were many and of various types. Amongst them, he would order me in the beginning to sell away all my books and to give away the money in charity, which I did. Those were precious books which could be sold for a high price. So I sold them and gave away the sales in charity but I became anguished at having to part with them as I had put much effort and had added notes and comments in them. It reached a point as if I was completely robbed of my knowledge. (At that time) he (al-Khawwas) said to me, “Strive to cut off your (heart’s) turning back (out of attachment) to them (the books) by much remembrance of Allah Exalted is He. Indeed they say, “One who turns back, does not arrive”. Thus, I strove in cutting off my attachment to them till I managed to free myself and praise be to Allah for that.